Free Sample Pack. Most firetruck manufacturers integrate diamond plate (treadplate) into their vehicles. On horizontal surfaces this creates a nice non skid surface. When applied vertically it does look good, however, it creates a problem when the fire department wants to make that area reflective. This is especially relevant on the rear of the vehicle where the NFPA 1901 guideline states that 50% should be striped with reflective yellow and red chevrons. 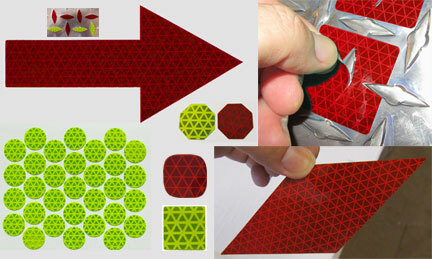 On flat surfaces the chevrons are easily created using red and yellow Rolls of Reflective Striping. 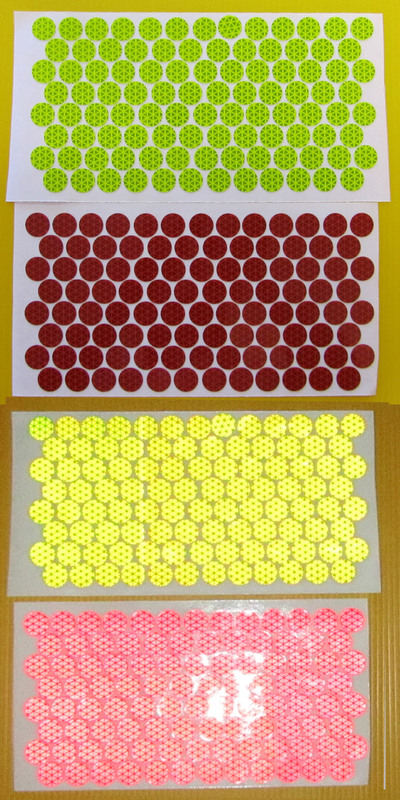 On tread plate or diamond plate reflective patterns or stripes can be created using 3/4″ dots, rounded squares or reflective appliques (panels). The 3/4″ dots are applied to the flat area between the raised treads. 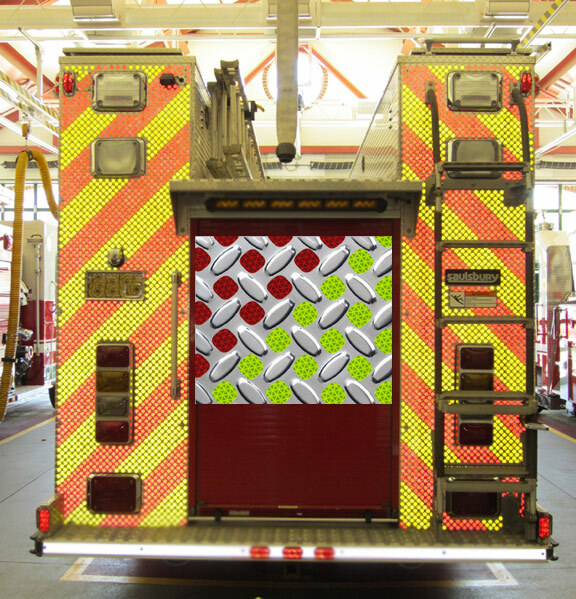 Specially designed reflective appliques/panels/overlays can be placed over the treads for more coverage. Applying the dots, squares or overlays is a little time consuming but very simple. Since the dots or overlays sit below the treads they are somewhat protected. 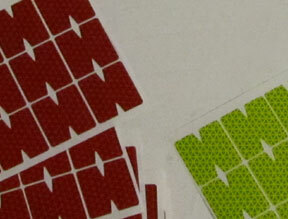 When using reflective dots or squares it is also easy to create numbers or letters within the diamond plate. We carry the 3/4″ dots, 3/4″ rounded squares, 3/4″ squares and overlays in a highly reflective prismatic material called Reflexite V98. All provide a viable solution to making diamond plate reflective so that it conforms to the NFPA 1901 standards. They can be ordered at www.reflectiveshapes.com . 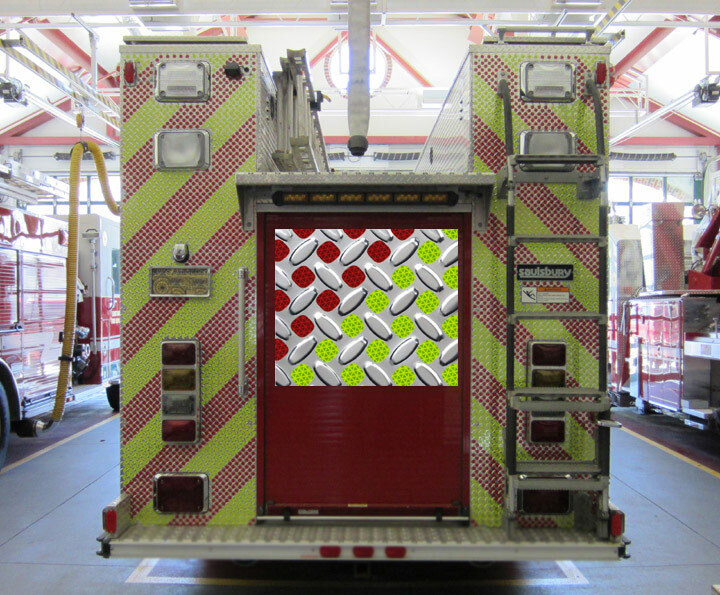 The pictures below show the 3/4″ dots installed on a fire truck. As you can see, the result is amazing and as I stated before, very simple. Just peel and stick. Taken with a flash camera.